How much backing is needed, if my quilt measures 63 inches by 78 inches? At a minimum 4-7/8 yards plus a bit extra for fabric not cut straight from the store. Regular quilt fabric yardage is used for the back. For these calculations I assume that the usable width of the fabric is 40 inches...usable width is what's left after the selvedges are removed. If the back needs to be pieced, I subtract another 1" for the seam allowances. The backing is pieced with 1/2" seam allowances that are pressed open to minimize bulk. 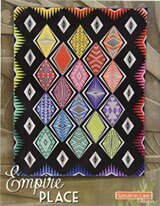 The lengthwise grain of the backing runs from the top to the bottom of the quilt. 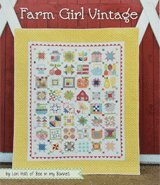 If the quilt hangs on a wall, the grainline will add stability. Backing is cut larger than the quilt top--generally 6-8 inches larger--here I'm using 8 inches. Since neither the final length nor width are less than or equal to the usable width of fabric (40"), the back needs to be pieced. Multiply the number of lengths by the length in inches and then convert to yards. Take the time to square up the fabric you use for backing. There's nothing as annoying as buying the yardage from your calculations, bringing it home and cutting it in half...only to find that it was cut crooked off the bolt and the resulting back isn't square. Because it isn't square, it turns out not to be big enough. To avoid this problem, I'll buy extra yardage with the intent of using it for a matching sleeve. (This extra amounts to 9" time the number of lengths calculated in Step 2 above). There's extra fabric if I need it for the back. If not, there's a purpose for it. And as always, buy backing fabric that you like. Most quilt shops have sale fabrics precisely for this purpose. Pick something fun from the stock and enjoy it. Frequently I'll add as much as 12" to the length and width of the quilt top (in Step 1) so that the scraps that remain (after squaring up the quilt) are a more usable/versatile size i.e. you have more options with a four inch strip the length of the quilt than a 1 inch strip. I hope this answer is helpful to you. Thank you for your question. Quilt measures 90"x110" backing fabric is 90 wide how much yardage do I need? The reason for the extra 8-12 inches is you need at least 4-6 inches on each side when quilting to have something to hold onto and protect the edges. Doubling 4-6 give you 8-12 inches because there are two pairs of opposite edges to a quilt back. The reason for 2 lengths is that 90" wide fabric has a usable width (that's after you remove the selvages) of something less than 90". It's not wide enough on its own to adequately cover the back of the quilt. 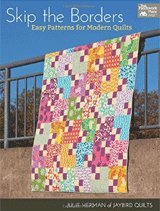 If you're having the quilt long-armed, your longarmer may want more. Thanks! This makes things much easier! Thank you, thank you, THANK YOU!! I've searched and searched for an easy, uncomplicated answer to my question and you nailed it! I thought it would be easy to find, but not so. Your site made it easy, quick and simple to understand. Now I'm anxious to buy the backing I need to finish a memory quilt. You are too kind! I'm so glad it got you un-stuck! Making a wall hanging or lap quilt for nephew for his lacrosse team 50 x 50 roughly not sure if I calculated it right need some help material is 44 wide. 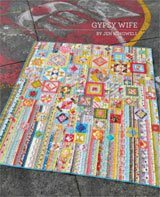 From the Editor: Because standard width quilt fabric generally runs 44-45" wide, you will need two lengths of fabric. So you'll need two lengths of 58" or 2 times 58" equals 116". To find the yardage divide this number by 36". There'll be lots of extra fabric leftover because you need less than half of the second length to cover the back. Choose something that makes you happy so you can use it up in another project. Found 60" knit fabric to back 68" sq quilt. How do I figure fabric and cutting? I assume you'll lose 2" removing the selvedges from your fabric leaving you with 58" of usable width. Round up to full lengths and you'll need two. A length is equal to the length of your quilt which is 74". 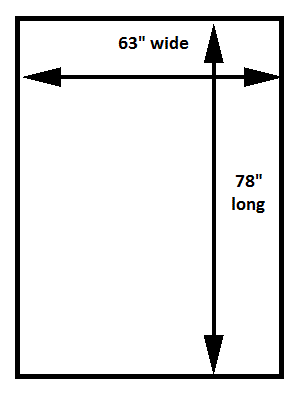 2 x 74" = 148"
Divide that by 36" to convert to yardage. Round up to the nearest 1/8 yard and you have 4.124 or 4-1/8" yard needed. A word of caution, if you are using knit on the back of your quilt because it is wider, you'd still need the same amount of fabric, 4-1/8", if you were using a standard 40"-42" quilting cotton. Knit is going to be hard to work with on the back simply because of the stretch. I'd suggest using significantly more pins as you baste your sandwich. Most definitely make a practice sandwich to see how it moves across the bed of your machine and to test whether or not you have any problems with puckering or pleating as you quilt. Your a a life saver, thank u so much having the instructions online. 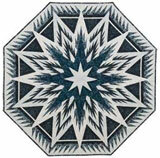 Im a later starter in quilting, I get a lot of my information on line. How do you figure yardage when using wide material? Julie replies...In Step 2 above, replace 40" with the usable width of YOUR fabric and then continue with the calculations. Remember that usable width of fabric is the width that remains after the selvedges are removed.